i love this. i love how simple it is: one image, enlarged, but then cut into segments and framed separately. 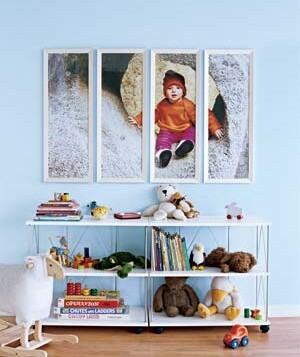 this idea is great for a few reasons: #1. you only have to pick one image #2. a few smaller frames are generally less expensive than one large one #3 your favorite image is now serving as wall art instead of being lost in a stack of 4×6 prints in the back of a drawer or cupboard. #4. by enlarging and then cutting the image into smaller divisions, it also adds visual interest. so, so cute. thank you real simple, for being awesome, as always.